As part of our Labyrinthos website redesign, we’ve been sorting through stacks of old photographs and remembering past travels and visits – so many labyrinths, so many memories! 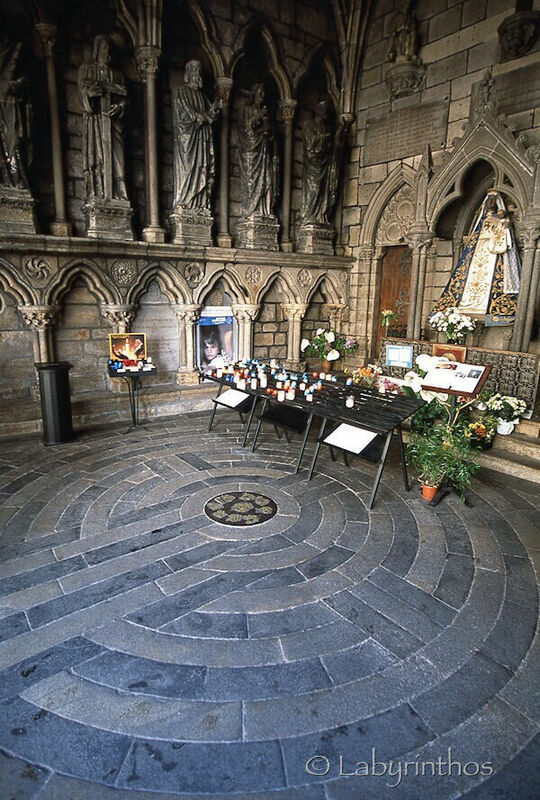 This lovely labyrinth in Guingamp, France, is one of our favourites although we have only seen it one time, way back in our early travels together, circa 2001. 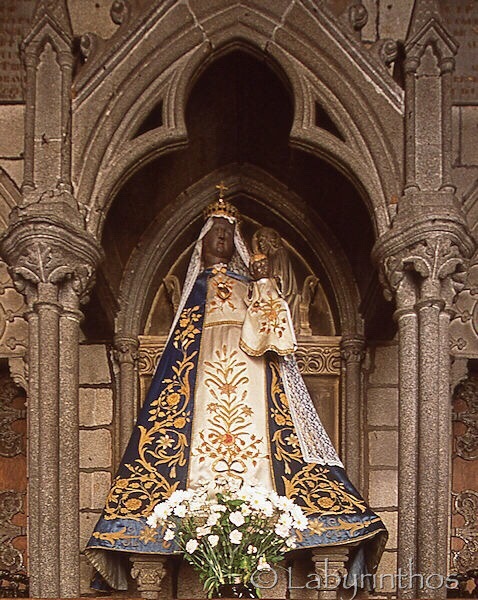 We were driving through western France where Jeff was researching European church labyrinths for his book and I was on the lookout for Black Madonnas for a research project of my own. As this was back in the days before smartphones and widespread Wikipedia, we often had to piece together little clues from diverse sources to guide us in our quests. We felt we had struck gold when we started reading about the basilica at Guingamp – a labyrinth for him and a Black Madonna for me! Imagine our surprise – and delight – when we entered the porch and realised the two were together, the noble Black Madonna presiding over the stone labyrinth at her feet. It took us quite a while to get our photos because of the steady stream of local residents passing through to pay their respects en route to their varying destinations and errands, a few with baguettes already in hand. Some bowed in the doorway, some crossed the labyrinth to kiss the Virgin’s skirt, while others stopped to light candles. We found ourselves deeply moved by this inclusion of the Madonna and her labyrinth in the daily lives of so many people – it wasn’t a festival or Holy Day, but just an ordinary weekday where the sacred and the mundane wove together in an inextricable fashion. The Chapel of Notre Dame de Bon-Secours is on the side of the Guingamp Basilica. The chapel dates to the 13th century, but the porch was demolished in the 18th century and rebuilt in 1854, at which point the labyrinth was added. The Black Madonna is credited with saving her country from a Prussian invasion in 1871, and according to Ean Begg, dislikes being moved, causeing a mighty downpours on the day on which she was supposed to be processed around the city for her coronation following the French Revolution. Consequently no further attempts have been made to take her outside since that time!